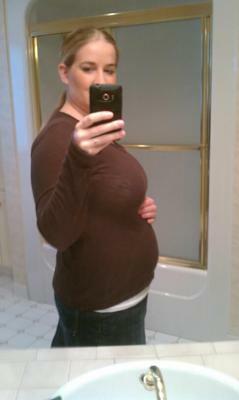 Here is my 1st viable pregnancy at 12 weeks with twins. My husband and i have been pregnant 2 other times, one was a miscarriage and one was an ectopic. So my husband and I went through IVF for these little twins. We are so excited but still nervous from the past but thankfully the 1st trimester is almost past. So prayers continues but looks like we might be okay this time. :) Thanks everyone and I hope you enjoy the pic! I AM NOW 31 WEEKS PREGO !! hi - it nice i got a comment i was so happy to see it -i am now 31 weeks prego with twins ..we are so excited and things are going well . My husband and I have been through 6 IVF procedures and we have a 3 yr old son and now we are pregnant with Identical twins. This was very unexpected as we only transferred one embryo. I am 43 and very nervous to be having two more. I am 9 wks today so I still have a ways to go. Thanks for sharing your belly pic. You look fantastic. My husband and I have a similar story as well. We had a miscarriage 10 years ago and for the past 9 years tried to get pregnant again. We are finally pregnant with twins thanks to IVF. We are 11 weeks today! I can't wait for 1st trimester to be over also. It is hard not to worry! Best of luck to you and your little miracles. Very cute! My husband and I have a similiar story. We had our son (now 3) with the miracle of IVF then had 3 miscarriages after him and we are now 13 weeks pregnant with twins, thanks again to IVF! You look awesome! It seems like as soon as I hit 12 weeks my belly popped. Due to the previous losses we have been hesitant to take any pictures but will start taking weekly pictures tonight! Good Luck in your pregnancy! Cute belly! My husband and I have been down a similar road, and this is our first pregnancy. I am currently 13 wks 4 days with Twins and I am so happy to be in the second trimester! Good luck to you! !